There is An Extra Clutch Back in The Box. You can Adjust it as A Tie Tack or A Lapel Pin for Your Preference. 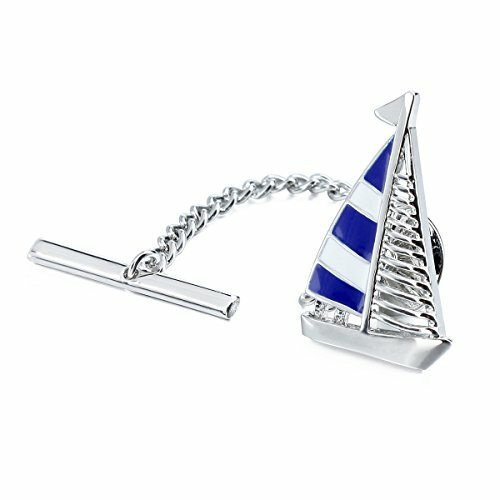 The Chain Is Strong Enough to Combine Your Tie And Shirt, If You Get Tired of Using A Tie Clip Then Tie Tack Pin Will BE Your Best Choice. Mens Novelty Accessories Suitable for Wedding, Party and Casual Wear As Well. Size: 23*15 mm, Chain:50 mm. Weight:3.8 g,Package : A Black Gift Box. Best Gift for Boyfriend, Brother, Friends. Best Christmas Gift. We Provide 90-Day Money Back Guarantee or Exchange If You Are Not Satisfied with Our Product.Or Contact Us If There is Any Problem.